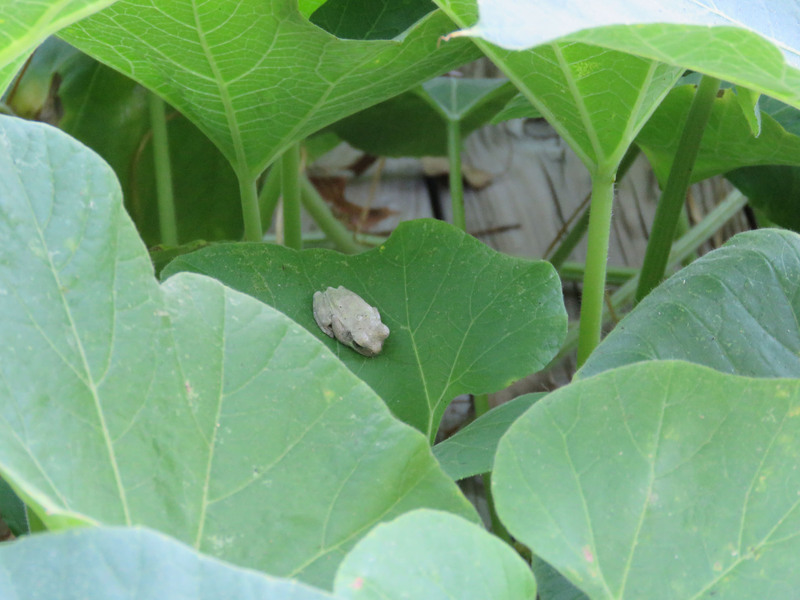 What is that on the birdhouse gourd leaf? 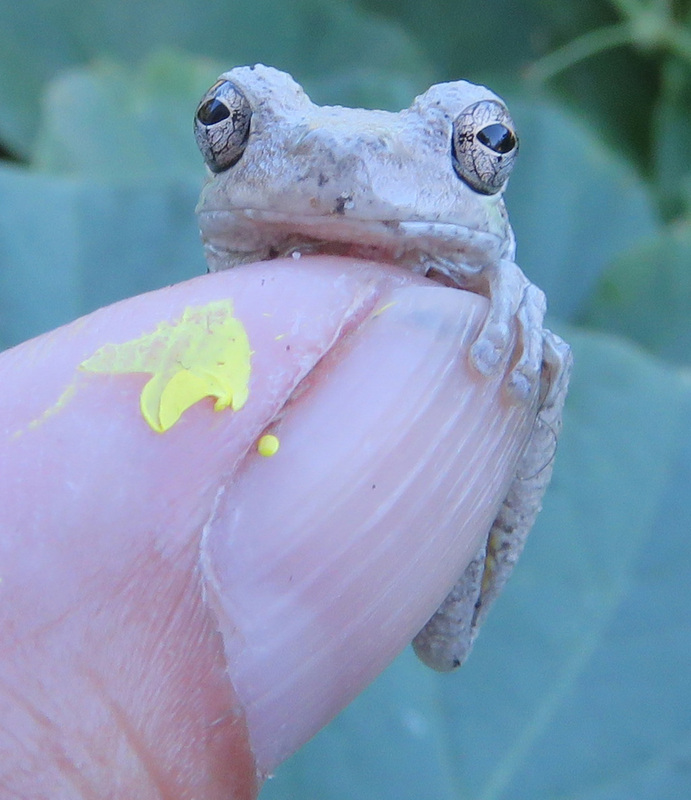 Why yes, it is a tiny frog! 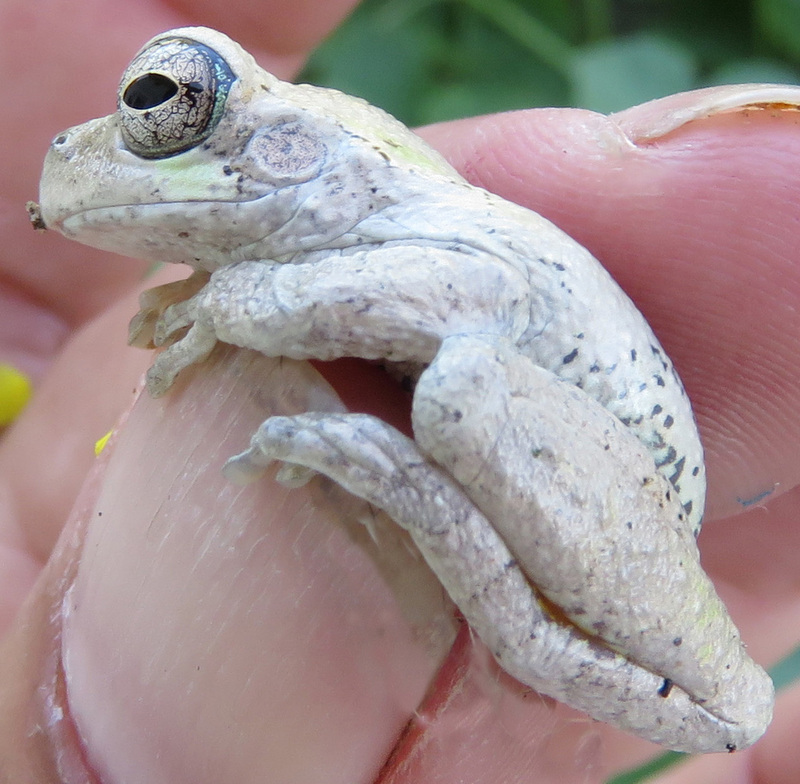 Cope’s Gray Treefrog, Hyla chrysocelis, or Common Gray Treefrog, Hyla versicolor. 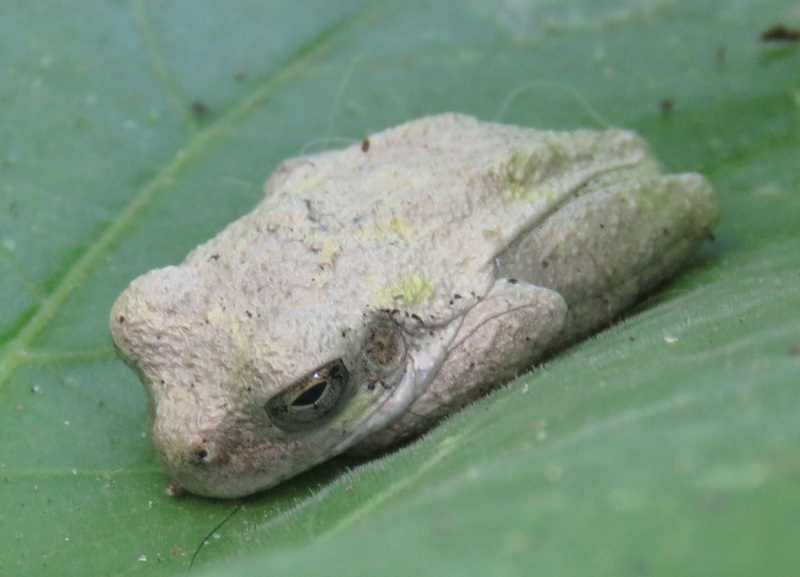 This is either a Common Gray Treefrog or a Cope’s Gray Treefrog. Even though they have gray in their name, they can be brown or green or blotchy. One characteristic that helps identify them is that there is a bright orange area on the underside of their thighs. The two species look exactly the same, except the Cope’s has half the number of chromosomes as the Common Gray, and it trills faster (from National Audubon Society Field Guide to Reptiles and Amphibians). I haven’t heard them trill, so I can’t tell. I never saw them before, but this year I have seen them almost every night. I actually have a CD of Texas frog calls. 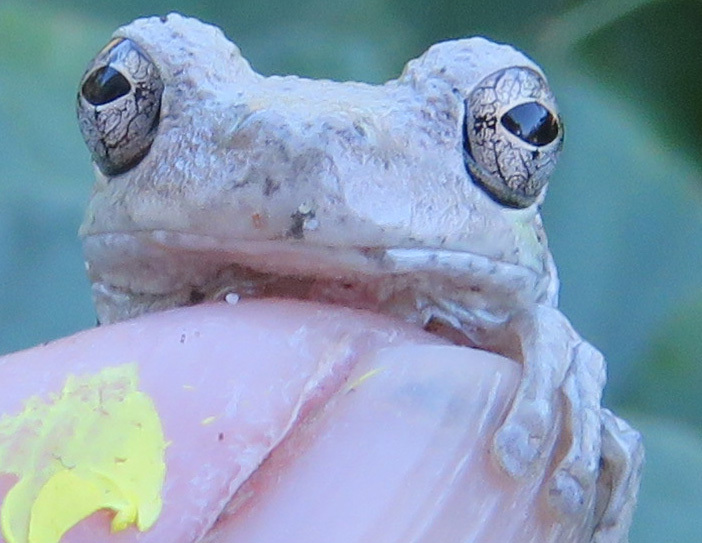 First an announcer tells you what frog you will hear, and then they play a recording of it. Some of them sound so fake, it is very amusing. I hope I hear a Sheep Frog sometime in my life! I feel like I have seen more tree frogs in the last few months than in my entire life! They are out in force; we usually see at least 2 a night! I know I have seen more than ever before too. 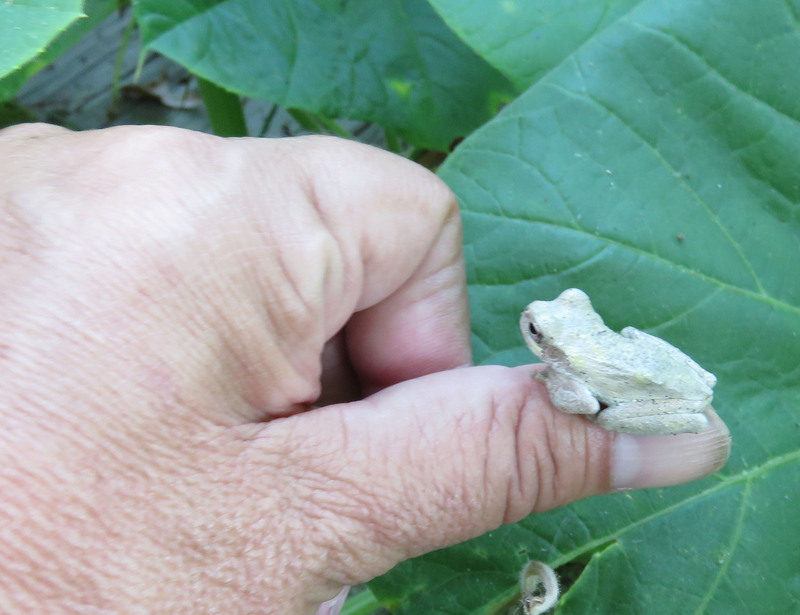 I felt lucky to see a green tree frog once a year or so — this year I have seen them several times, and the gray ones every night too! What great close-ups! And it truly is so, so cute. How on Earth did you get one to stay on your thumb!? Since seeing your pictures, I have tried and tried and I never even get close. Granted I usually have an eager 3 year old trying to “help” but I am not convinced I would have much better luck on my own.